The quake struck Amatrice and the surrounding area at 3:36 a.m. — amazingly, almost the exact same time as the one that devastated L’Aquila and Abruzzi in 2009, which killed over 300. Some of the dead, this time, were tourists. Travelers go to Amatrice in August for the mild climate, an evening stroll and spaghetti all’amatriciana — a dish famous all over the world, invented by local shepherds in the Middle Ages. This week, the town was getting ready for the 50th annual festival dedicated to the celebrated sauce. Luckily, most visitors had left for the night. But the Hotel Roma had 70 guests, and at the time of writing they are unaccounted for. So wrote Beppe Severgnini, a columnist for Italy’s Corriere della Sera in the Opinion Pages of The New York Times today. 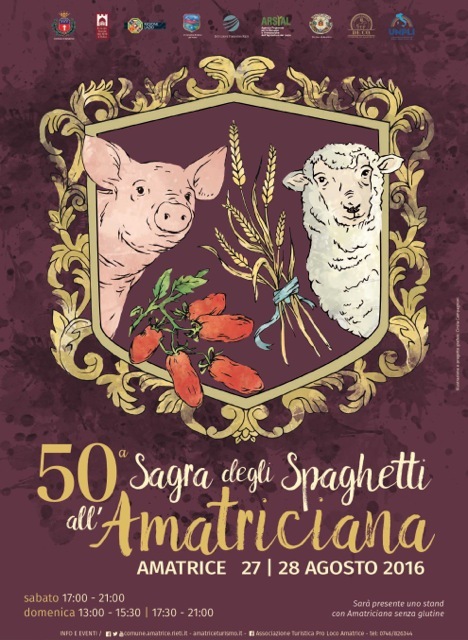 Poster advertising the 50th Spaghetti all’Amatriciana festival in Amatrice. I heard the news just after midnight, coincidentally nearly a year to the day that Nat and I drove the old Roman roads for the picturesque mountain villages of the Apennines—Norcia, Amatrice, and Ascoli Piceno, where the Umbria, Lazio, and Marche regions merge. As it happens, I was still working in my kitchen, up to my elbows preserving the last of the summer’s tomatoes. My tears mingled with tomato juice on the cutting board as I listened to updates coming in on the radio and called to mind my first stop there many years ago to learn the secrets of the best “sughetto all’amatriciana,” as the now world famous sauce was known in the local parlance. Just the tomatoes, and just enough, for “amatriciana.” | Photo: Copyright Nathan Hoyt/Forktales 2016. The rest of the day was all but lost except for picking up where I left off the night before preserving the remaining tomatoes that my daughter Gabriella had brought me in a big box from her CSA a few days earlier. 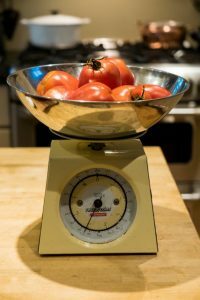 There were six pounds more of Juliet mini-Romas to cut, seed, and oven-dry and a mere two and a half pounds of a rich red, thick-walled variety to put up that I didn’t know the name of. 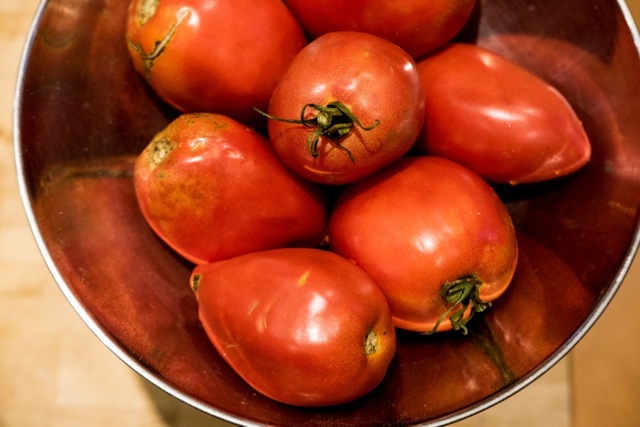 I’d never seen that heart-shaped type before, but a bite of one that had split open proved dense and succulent without being watery, and it had a bracing sweetness—better than any of the Romas I’d ever tasted outside of Italy. There were just enough of them to make a sughetto to cover a pound of our favorite spaghetti, which we took as a sign; off Nat went to buy a fresh hunk of pecorino and pancetta (guanciale was not to be found) for the proper makings of the dish, the method for which I had been carefully instructed so long ago. At dinner, we said grace and remembered the little town founded by the ancient Sabines on the soft slopes of the green Tronto Valley that survived Romans and Lombards, Angevines and Aragonese, Fascists and Nazis, and hosts of other menaces in between, but not the earthquake of 2016; a town where the people once regaled themselves with spaghetti anointed with tomato, bacon, and sheep cheese. We ate, grateful for the dish they invented. 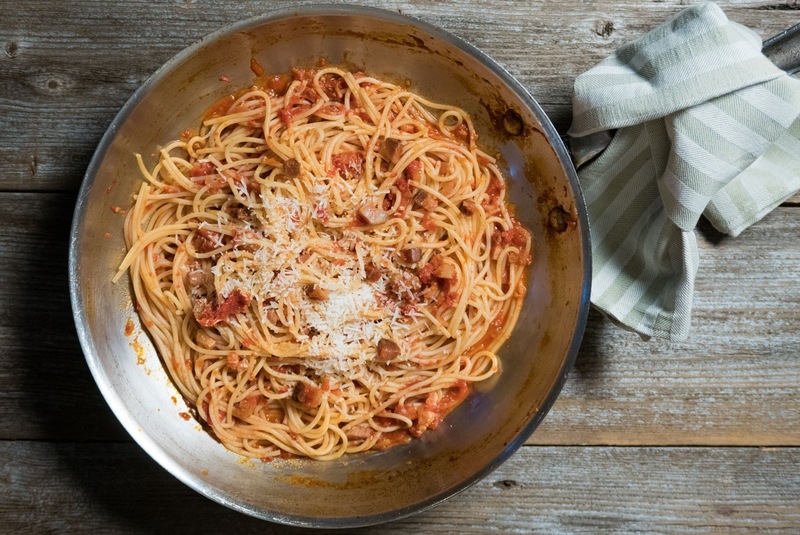 Tragically, there will be no Sagra degli Spaghetti all’Amatriciana this weekend, but here’s the recipe if you would like to make it in memory of those who died on August 24, the day Amatrice disappeared. This dish, which originated in Rieti Province, is one of Latium’s best-known pasta specialties. The sauce is traditionally made with guanciale, salted and cured pig’s jowl, a specialty of the province and of Latium in general. Pancetta can be substituted. Over the years, the recipe has sometimes seen olive oil replacing the more tasty lard of tradition. The genuine method involves adding grated pecorino (semi-aged sheep cheese) in three stages, once during the cooking of the sauce, once after the pasta is cooked but not yet sauced, and a last time when it is sprinkled on the served pasta. The semi-aged cheese deepens the flavor and gives the sauce a voluptuous consistency. *A note about the pecorino, which is such an essential part of the dish: A semi-aged pecorino (sheep cheese, or cacio) from the Roman province would be ideal. I found it in the U.S. in recent years in good cheese specialty shops, including the cheese departments at most Whole Foods stores. The aged pecorino romano that has been imported here for so long is exceedingly salty and dry in comparison but if that is all you can get, cut down on the 1/2 teaspoon salt called for to season the sauce. In a large skillet, warm the olive oil over medium-low heat. Add the onion and pancetta and sauté until golden without allowing the onion to brown, about 12 minutes. Stir in the hot pepper and the tomato paste. Add the tomatoes, their reserved juice, and the sea salt. Simmer, uncovered, over medium-low heat until thickened, 15-20 minutes or as needed, stirring occasionally. Stir in 2 tablespoons of the pecorino. Remove the pan from the heat, cover, and keep it warm. Fill a large pot with 5 quarts of water. Bring it to a boil and add the pasta and the salt. Stir immediately. Cook over high heat, according to package directions (cooking times vary from one manufacturer to another depending on their particular wheat blend and drying process), stirring occasionally to prevent the pasta from sticking together until it is 1 minute shy of al dente. The pasta must not be overcooked. Drain the pasta, setting aside 2 tablespoons of the cooking water; return it to the cooking pot and toss it together with the reserved cooking water and 2 tablespoons more of the grated cheese over a high flame until the moisture is absorbed, 15-30 seconds. Transfer the pasta to the skillet with the sauce, and toss well. Sprinkle in the 2 more tablespoons of pecorino and toss again. When the strands are well coated with the sauce, remove the skillet from the flame and serve it at once, piping hot. Pass more pecorino at the table. Thank you Julia for this beautiful story. It makes my heart ache. And for sharing your memories. Having not yet made it to Abruzzo, I can only imagine how you and Nat must be feeling. Your words made me cry for all those lost souls and the survivors who will be in need of so much help. Ever since hearing the news and before learning of the forthcoming sagra to celebrate this simple but so tasty pasta, I thought of making some in honour the people of Amatrice who have this burden to carry and deal with in some way. It’s too much. Thank you Phyllis. Both of our hearts are aching. Great Story Julia, thanks for sharing! I’m so sorry we didn’t get to meet last fall while you stayed at my place here in Savannah. Let me know if you and Nat are headed back this way again. Thank you, Darin. Yet, it seemed we had opposite schedules, but we enjoyed your lovely house and had a wonderful time in Savannah. I don’t know the exact varietal, but your “heart-shaped” tomatoes are definitely oxhearts. Isn’t that a lovely term for them? I’ll share this on my Facebook wall and tag Cynthia Sandberg, who owns Love Apple Farm. She is setting out to curate over 6000 kinds of tomatoes, with the World Tomato Society—she might know more. Funnily enough, we thought we’d planted a Jersey Devil but it turns out to be some red oxheart varietal. Our summer is so late that the first ones are just coming ripe. I will be able to taste them tomorrow. Peace to all—we visited Italia in April, 2001. It was a dream come true. I long to return, but perhaps only in my cooking. Funny, after scouring seed sources online to try to match up what I had with the right varietal, I came to the conclusion that they must be ox hearts. I didn’t publish the name because I wasn’t absolutely sure, so imagine that I was delighted to find your comment this morning. Beginning next summer, I’ll plant them in my garden. Cynthia Sandberg sounds like a great resource for me, and I’ll certainly contact her. Grazie mille, as the Italians would say, and good luck with your medical procedure. You might want to begin your recovery with spaghetti all’amatriciana. It’s good for the soul. Thank you for sharing this. As I prepared the meal, I told all of the vendors I visited( farmstand, grocer, Italian specialty shop) about your post and they all shared their sorrow. It was a memorable meal. That warms my heart, Rick. And how did it turn out? So good that I’m making it for the family again this evening!! And I will be sure to share your post. Whenever someone tells me they made one of my recipes I feel as though I was at their dinner table. Sometimes I think that’s the reason I write about food and recipes. So I feel like I was a guest at your meal and I’m grateful. I know you made it well and so glad you enjoyed it! Thank you,keep up the good work, Olio2go! Made this with guanciale last Tuesday evening. Otherwise followed your recipe to the letter. My best friend called it “glorious pasta!” I certainly agree. It was divine. So sorry for the reason for the emphasis on this delicious dish, though. It’s truly tragic. You know, I got a message–only one–on the day I posted this, from someone saying I was capitalizing on the tragedy. And I got hundreds from other readers on social media thanking me. As I said to the person who wrote the first message, food in traditional cultures such as Italy, has a place in joyous celebrations and holy festivities–and also in rituals acknowledging and grieving death. I see the circulation of this recipe as a way of expressing my grief, and so did so many other people who have made it, causing them to reflect, even if just for a moment, on the disappearance of Amatrice. I’m so glad you were one of them, June. Thanks for writing. 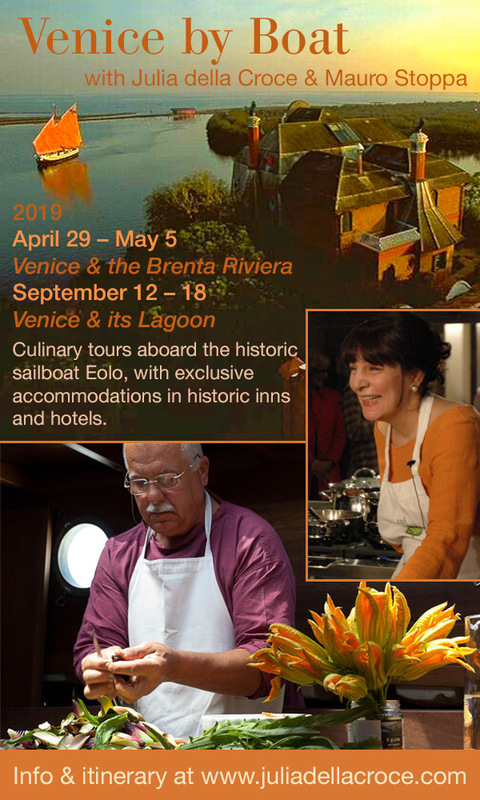 I wouldn’t say the recipe put Italy on the map, but certainly has become wildly popular abroad.